To trigger an attack, left click on the target, repeatedly or holding down. 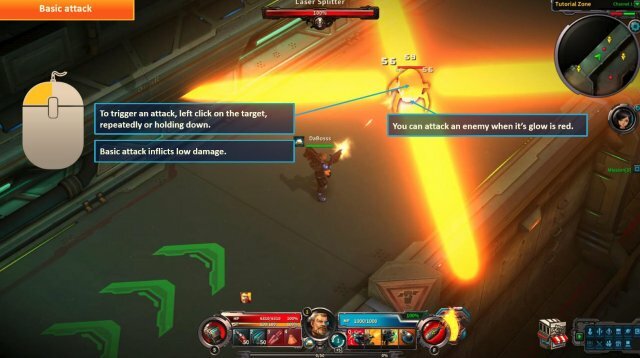 Basic attack inflicts low damage. 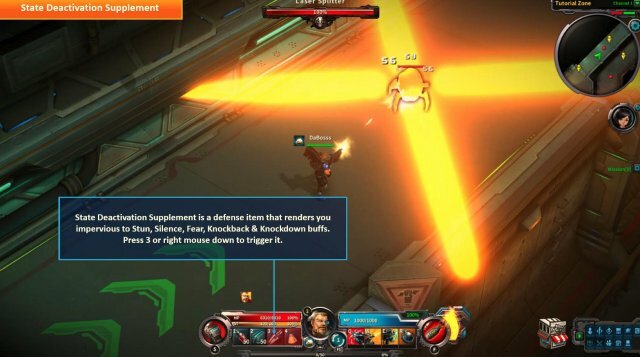 You can attack an enemy when it’s glow is red. By clicking on Shift key and left mouse down at the same time you can attack without moving from your position, in the direction of the cursor. Attacking from a safe distance helps you to prevent the enemy’s damage and HP consumption. Skills are powerful attacks triggered by clicking on Q W E R or F keys while left clicking on a target. They have cooldown and inflict high amounts of damage. Skills Q W E R consume MP. The most powerful skill is at the right of the character HUD (F). It consumes Special Gauge. Skills Q W E R consume mana points (MP). You can monitor your mana points with the blue bar at the character HUD. Mana points are not recovered automatically. You shouldn’t go into battle with low MP. Make sure you count with MP recovery means before going to battle. 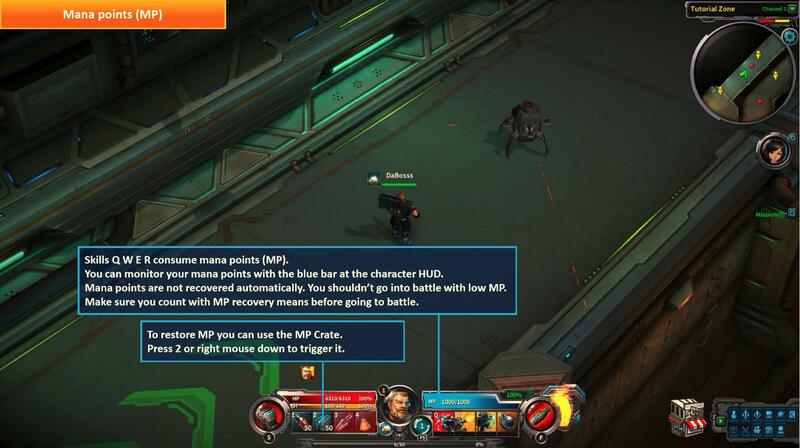 To restore MP you can use the MP Crate. Press 2 or right mouse down to trigger it. Skill F consumes Special Gauge. You can check the special gauge provision at the green percentage and yellow tank. Enemy’s HP bar. To defeat an enemy, their HP must drop to zero (0). When their HP drops to zero, the HP bar will disappear and the targets will either disappear or become inactive. 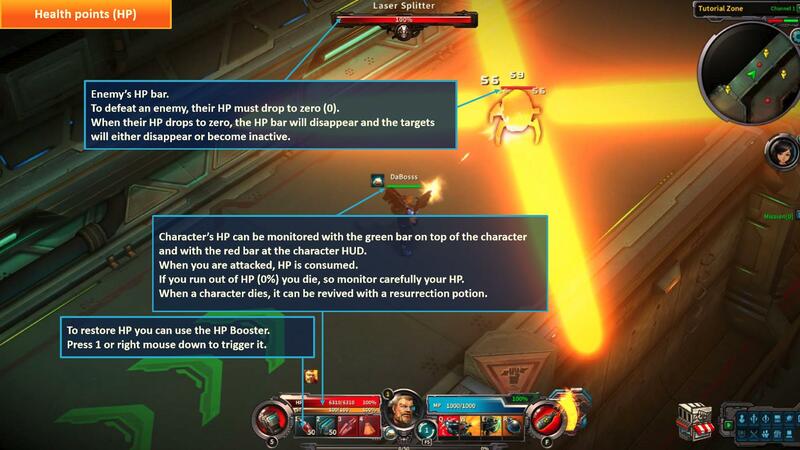 Character’s HP can be monitored with the green bar on top of the character and with the red bar at the character HUD. When you are attacked, HP is consumed. If you run out of HP (0%) you die, so monitor carefully your HP. When a character dies, it can be revived with a resurrection potion. To restore HP you can use the HP Booster. Press 1 or right mouse down to trigger it. 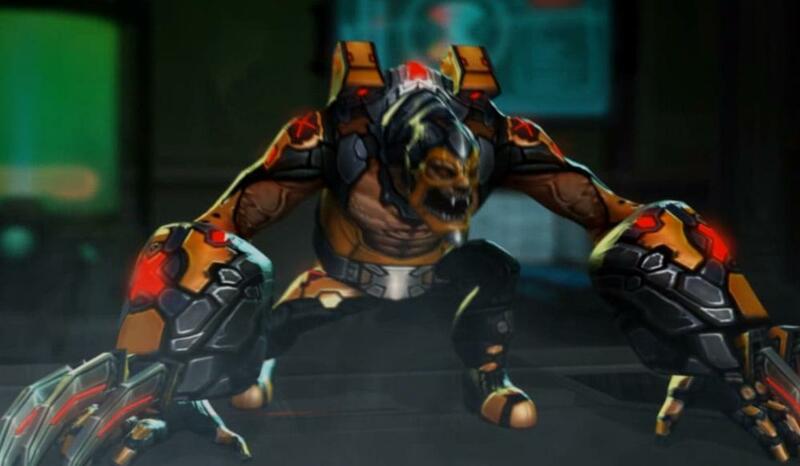 State Deactivation Supplement is a defense item that renders you impervious to Stun, Silence, Fear, Knockback & Knockdown buffs. Press 3 or right mouse down to trigger it. 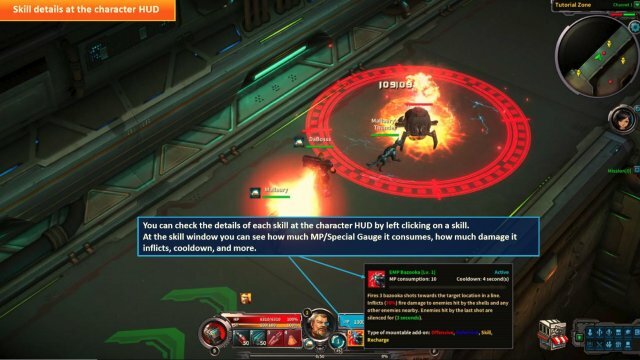 You can check the details of each skill at the character HUD by left clicking on a skill. At the skill window you can see how much MP/Special Gauge it consumes, how much damage it inflicts, cooldown, and more. ClickonK keytoopen theSkillwindoworclickon the corresponding icon at the bottom right UI menu. 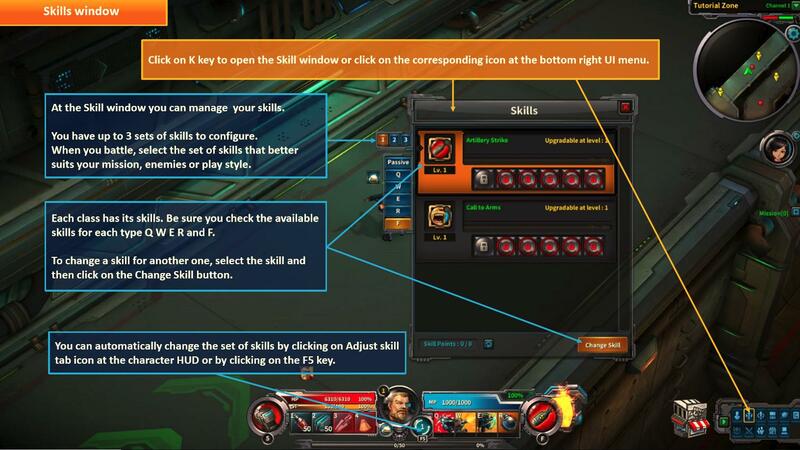 At the Skill window you can manage your skills. You have up to 3 sets of skills to configure. 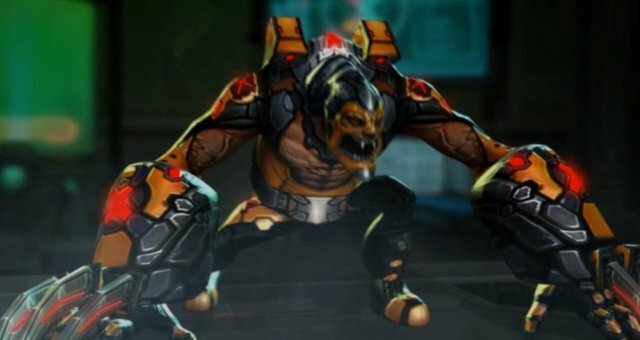 When you battle, select the set of skills that better suits your mission, enemies or play style. Each class has its skills. Be sure you check the available skills for each type Q W E R and F. To change a skill for another one, select the skill and then click on the Change Skill button. You can automatically change the set of skills by clicking on Adjust skill tab icon at the character HUD or by clicking on the F5 key. 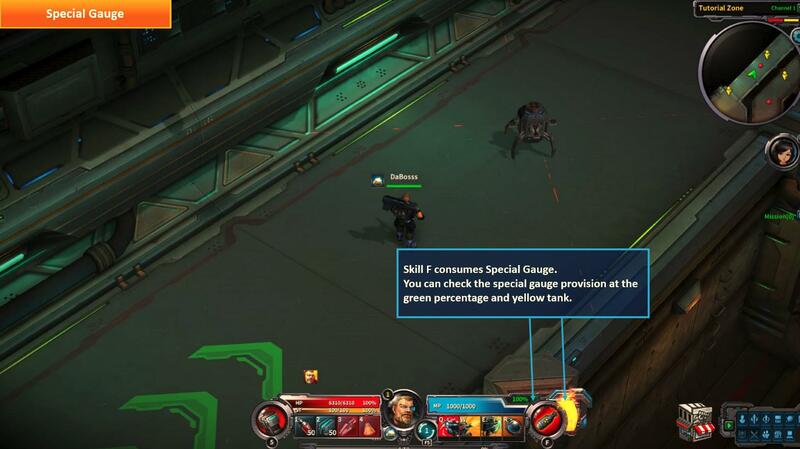 As you progress in the game, skills will become upgradable. When skills can be upgraded, the upgrade skill icon will appear at the right of the character HUD. 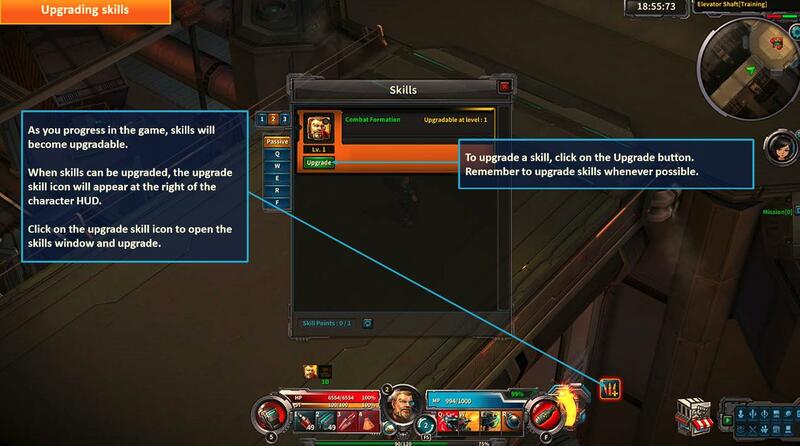 Click on the upgrade skill icon to open the skills window and upgrade. To upgrade a skill, click on the Upgrade button. Remember to upgrade skills whenever possible.